Since joining the PMQ Pizza Magazine staff six years ago, pizza has traveled with me on many an airplane or car ride back home to Oxford, Mississippi, from pizzeria visits around the country (you'd be surprised how well it keeps). My latest gift came in the form of two pizzas from Imo's in St. Louis. My friend Pat has been talking about this place for years. 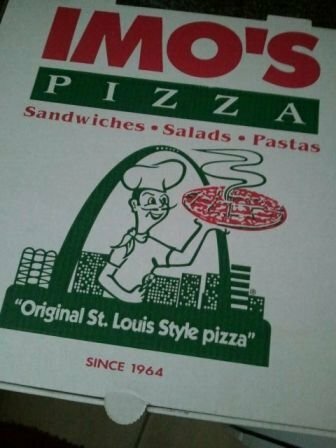 He grew up on Imo's and said it was a must try. I haven't been able to get up to St. Louis, so when he went last week, he brought Imo's back! I popped it in the oven and the super thin pie emerged crispy and cheesy. I'm not the only one who enjoys pizza from far-off places. A growing number of pizzerias are offering their pies for mail delivery to people who just can't live without them. Still more have begun mass producing and supplying pizzas to local and national grocery store chains so that we can always have access to a taste of home. How many times has someone come into your pizzeria and told a story about eating your pizza when they were younger, or wanted to experience it again after moving away? Have you ever considered shipping or freezing your pizzas? Let us know in the comments section below.